Broken garage door springs means your door will not be able to work properly or at all. We are proud to offer a fully comprehensive set of garage door repair services in Illinois. We fix all parts. We handle all types of doors from wood to glass ones. We are experts in the garage door openers from Genie, LiftMaster, Wayne Dalton and all other leading brands. Experienced garage door specialists available for all types of repairs and services. Highly qualified technicians providing high quality service. 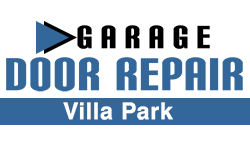 At Garage Door Repair Villa Park, our staff and crew is dedicated to garage door service. We want to be the garage door company in Villa Park, Illinois, that everyone can depend on. There is nothing more important to our garage door contractor than earning the respect of the community, where we not only work, but live as well. We offer a variety of garage door services and we do our very best to excel at each and every one of them. If you need reliable garage door repair, we are the company for you. Garage door repair services are important for the outstanding functioning of your door. Component parts may break, snap or just worn after excessive use over the years. Repairs are the heart of our services. Our technicians fix broken springs and door off tracks every single day. Over the years, they have gained a lot of experience, which in combination with their expertise as licensed and certified tradesmen make them ideal for each garage door problem. They are some of the most significant parts of your garage door. Whether you have torsion or extension springs installed on your door, they will balance its weight in order to be lifted with ease. Our techs carry an assortment of both Torsion Springs and Extension Springs on their trucks. The torsion springs are used for heavier doors and, therefore, to get the proper leverage they are mounted on the left and right of the door center. The Extension Spring is used for lighter doors and, therefore, is mounted on the left and right at the outside of the doors. You can also get either one of these springs in galvanized material. They are durable, look great and last for decades. The springs are wound tight in order to carry the weight of the door and, therefore, you should refrain from fixing them on your own. Our professional techs have the knowhow and the proper equipment to finish the job with safety and speed. If you own a garage with an automatic opener, then you definitely want a garage door remote system, so you can open and close that door without ever leaving the comfort of your vehicle. Once again, we only offer brand names that are trusted like Genie Intellicode, Liftmaster security +, Clicker, and Multi Code. Our techs have the skills to repair, replace or install these for you the same day you call. It would be best to have a professional do this for you, so please give our Villa Park repair company a call when you are ready to have it installed. Garage door cables & tracks require a lot of attention as well. Quite often a customer will call us and say a cable snapped or complain about a loose cable. When they do we send someone right out to fix it. Once in a while they call because a cable came off the drum or they find a broken cable. Our techs can solve the problem quickly and efficiently. Our Company in Villa Park, Illinois, is ready to come out and replace garage track or repair bent garage door track the same day you call. Our garage door service in Villa Park also cares deeply about our garage door maintenance & adjustment service. We believe in preventative maintenance and that is why we offer our regularly scheduled lubrication service to all of our customers. It is best to pay a little now, than pay a lot later. Our experienced techs change tons of garage doors. We offer a great selection to choose from in various styles and designs. Wood and steel garage doors, aluminum and craftsman garage doors and of course glass garage doors, which are classy and, thus, very popular and really improve your curb appeal. It is our goal to make sure our customers can get service at any time day or night. That is why we offer emergency garage door repair service for our community. In addition, we do our best to provide same day service as well. Our techs are standing by to take care of your garage door repairs. Please visit us in person and let us be your garage door company. The moment you need any services for garage door repair or replacement, call our company. We cover areas in zip code 60181 in Illinois. So if you feel that your doors are giving you problems, make sure to give us a call.